RickBoyne.com: Sooners to play Missouri! 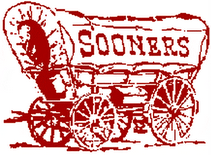 The Sooners are now scheduled to play the Missouri Tigers December 6 at 7 pm in KC, MO, for the Big 12 Championship! Alright, I dare say I barely pay attention to this college football thing except for the big games every now and then. I root for BCS chaos as often as possible. So if Alabama loses, (sorry Steve) and OU wins (way to go Rick) is it possible for OU and UT to get a rematch for the BCS title after UT doesn't win the Big 12 and did beat OU head to head? Just curious, cause I'd pay attention to that while I wait for the Cowboys to win a playoff game on the way to their next Super Bowl someday. My goodness! Who knows with the nonsense that is BCS!?! Jody, thanks for the sympathy, but you are correct in your review...and FL (who I can't stand) would be left out, even though they beat the #1 team in the nation, was the SEC champs, and is currently #2 in the Harris poll...it ain't fair! The Gators will be there... count on it! It is certainly a surprise that we will be playing Florida instead of Alabama. Quite frankly, I'm happy to be playing at all! It will certainly be a great game. I'm really, really looking forward to it. A couple of years ago in Pattaya, just after OU lost to Texas, there were some USC people or some other school that was giving me guff about Oklahoma losing the National Championship. I asked them what school they went to; they told me. I then told them I thought it was funny that their school didn't even get a CHANCE to play for the national title.